I love geography. Out of all the social sciences, it is probably my favorite. I’ve loved it since I was in elementary school when I would read the geography volume of a children’s encyclopedia set I owned. I would dream of traveling one day and seeing all of the monuments and places with my own eyes. Learning and appreciating the culture of a specific people and even using maps to travel make me giddy with excitement. However, I’ve repeatedly found that geography in most homeschools is either neglected or relegated to a small portion of the year. Geography is really the hub around which the social sciences of history, sociology, economics, and government revolve. Why did the civilizations of Mesopotamia, Sumer, Egypt, and Greece flourish if not for the access to water routes to trade and survive? That’s geography. Why is the great plains region of the United States called the nation’s breadbasket and what impact does the terrain have on the ability to grow vast quantities of food there? That’s geography. Why did the Ancient Greeks invent democracy due to the fact that their country was divided into city-states which held smaller populations of citizens who could all take a role in government? It was because of geography. Why did Viking society become explorers of Europe and the North Atlantic? Because of the geography of their homeland. Hopefully I’ve convinced you that this subject doesn’t need to be relegated to a blurb every so often, but an important part of your child’s education. Geography is generally divided into three categories: cultural, political, and cartography. Cultural geography is where you study the customs, religion, and characteristics of a group of people, political geography is a study of country/state names and locations, and cartography is the study of maps or how to read maps. It might seem daunting to cover all of this while homeschooling your other required subjects as well. Below, I’ve summarized three approaches and each one’s pros and cons to teaching geography in your homeschool. Hopefully one of these will speak to you, and you can begin to plan how you can incorporate geography into your coming school year. Teaching geography via other subjects is by far the most common way to cover the subject in homeschool circles. I don’t know of any history curriculums on the market that don’t include some geography component and even some literature based curriculums include geography as well. I’ve even used a couple of science curriculums that had geography thrown in here and there. Easy to find already put together on the homeschool market, which means there is minimal work on the homeschool parent’s part. If you want quick and easy to make sure most of your geography bases are covered, this is it. Incorporating geography into other subjects lets kids quickly visualize the area being discussed. It’s much easier to see the spread of Islam across the Middle East, Africa, Asia, and into Europe during the Middle Ages if you map it, than to try and merely read about it. Many times geography plays a key part in history, literature, science, etc. These connections often make it easier for your children to remember places because it is tied into the book they are reading or the science they are studying. For example, whenever I hear the phrase “ring of fire” my mind automatically flashes up a map of the Pacific Ocean (not Johnny Cash) and the “ring” of land around it that is known for large amounts of volcanic and seismic activity. Thanks, fourth grade science! Often country names and/or boundaries are not the same today as they were in the history books. If you solely depend upon history to teach geography, you might find yourself in a bit of a pickle. It doesn’t take a rocket scientist to realize that the worlds has changed its political boundaries since ancient times. Because of the point above, it can be difficult to learn and memorize country names and their locations. If you’re only jumping into into geography periodically through other subjects, especially history, then you might find your children forgetting more than they are remembering about locations. Usually the approach of incorporating geography leaves out the cultural and cartography branches of geography. When you are using other subjects as a vehicle to teach geography, it becomes awkward to stop your studies and dive into a rabbit trail about the modern culture of the area or work on latitude and longitude. Obviously that’s why programs that incorporate geography in some way do not do this, but these aspects of geography are still important to learn. While this approach isn’t as common, there are definitely some curriculums out there and homeschool parents who decide to take a year or two and focus solely on geography. Most often I see this happen in either Kindergarten or first grade before starting the study of history or in the middle grades (6-8th grades) before students move into high school studies. The reason for this placement is because a good knowledge of geography, cultures, and maps will serve students well as they approach more rigorous work in the coming years. Students are able to really dive deep into the subject instead of getting a bit of geography here and there when it pops up in the curriculum. The best way to learn anything is to really immerse yourself in it and geography is no different. Spending a year to do nothing but explore the world and the people in it can only benefit any future learning. When you choose to study geography as it’s own subject, you can really work on learning and memorizing where countries, states, provinces, capitals, etc. are located. By giving geography its own time slot in your homeschool day or week, you know these things are being covered where they might not be if included in a history, science, or literature curriculum. So probably my favorite aspect of taking time to study geography as a subject is that you get to read all of those great, living geography books, like Paddle to the Sea and Halliburton’s Book of Marvels, and various fiction books set in other countries. Nothing helps children understand a place then to read about people who’ve been there or live there. When geography study is covered in other subjects, you usually don’t have the time to read geography books as well. One of the hesitations many homeschoolers have with taking a year or two to focus on geography is that it usually means dropping another subject, like history. If you are committed to a specific history cycle schedule, this could be problematic. Geography is one of those subjects that can very easily become boring if not implemented well. If you focus too much on cartography, memorization, or political geography facts (like filling in worksheets about population size, state bird, greatest export, etc.) and not enough on cultural geography, which kids generally find more fun and enjoyable, than spending a year on geography or including it as a separate subject might do more harm than good. Probably this is what most homeschoolers do to teach geography even if they don’t call it by a specific name. I know that I use this approach in my homeschool. Basically every year, I try to make sure and cover all three areas of geography. To cover cartography (map skills), I assign workbooks that cover those once my children can read and understand instructions. For cultural geography, I choose an area of the world to study for the year, usually it’s loosely aligned with a time period we’re studying in history. I select some great books written about the region or about the culture or religion in the area. Some of these I read to the kids and usually one I assign for my kids to read on their own. For political geography, we work on memorizing the countries and major land forms and bodies of water in the area. We work on this as a family for the entire year. And, of course, the history program we use has a geography component that we study when we come to those lessons in our history program. By melding the two approaches above (geography via other subjects or geography as its own study) into your own unique combination, you are certain to cover all three aspects of geography every year or at least on a regular basis. Hopefully by doing this, you can save yourself from that sudden realization one day that you have totally forgotten to teach your children the states of the United States or how to read a map! Unfortunately, this approach usually means that you, the homeschool parent, have to find resources to teach geography in this way. Sometimes the convenience of using programs that are already created for you is more important than covering geography this thoroughly. By no means is any one of these three approaches better than the other. You should always do what works for your homeschool and your family’s priorities, of course. 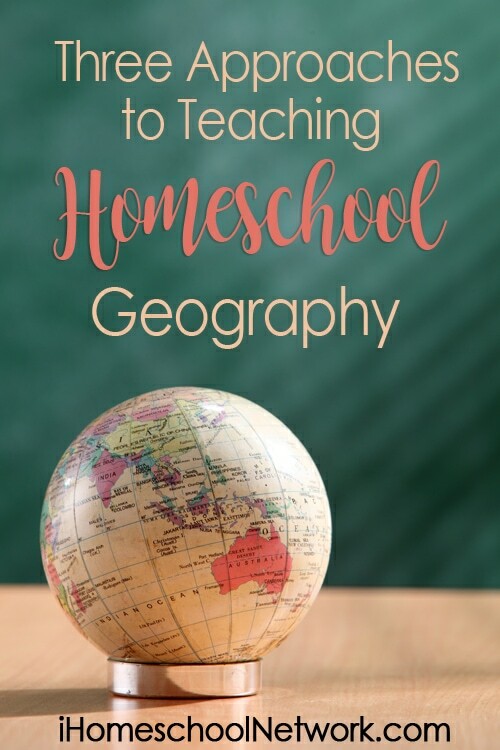 Hopefully, you are inspired to continue teaching geography in your homeschool whether its through another subject, as a study unto itself, or a combination of both.